Kick off the season o' green with a good old Shamrock Shake from McDonald's, a tasty treat that has been a staple around this time of year since 1970. Oh yes, it's been putting people in carb comas for nearly 50 years! Shamrock Shakes: facilitating relationships in random parks since 1970. Courtesy of GIPHY. "Get your mint on with the shake that started it all. Creamy, dreamy vanilla soft serve blended with Shamrock Shake syrup and topped with delicious whipped topping," says the McDonald's website. Somewhere, there's a super pissed-off leprechaun looking for his hat. Courtesy of GIPHY. Interestingly, the Shamrock Shake recipe has undergone some changes over the years. Way back in the '70s, it was actually made with vanilla ice cream, lemon-lime sherbet, and vanilla syrup. Sort of a creamy, Sprite-tasting concoction. Somewhere in its timeline, it's was also a Shamrock Sundae drizzled with mint syrup. 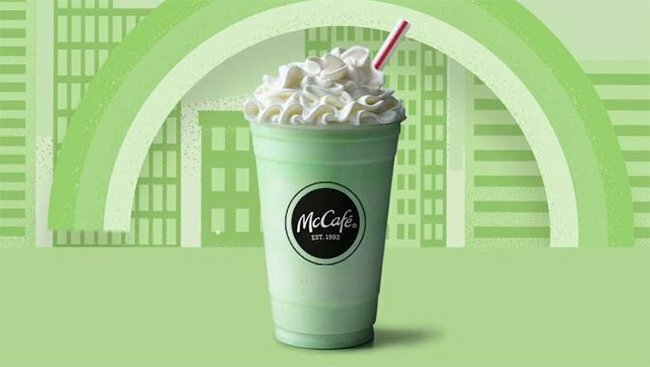 Then McDonald's took all the fun out of it, and just served the original vanilla shake with green food coloring. Today, mint lovers must be feeling lucky, because the eatery has added the Shamrock Shake syrup to the mix and blended it all into a fresh flavor that is anything but vanilla. But, here's a secret that the Mickey D's bigwigs don't want to get out: You can make this at home with only six ingredients, so you could go wild and drink this any time of the year. Check out Delish.com's Copycat McDonald's Shamrock Shake recipe. Are you a Shamrock Shake fan? Are you one of the lucky leprechauns that have tried out all three recipes of the shake? Let us know in the comments.